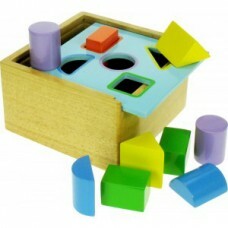 A selection of shape sorting and stacking toys. Great for developing hand-eye coordination, shape and colour recognition by learning through play. 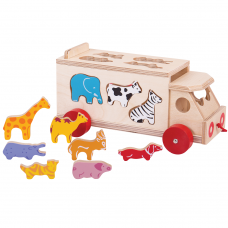 A pull along toy with 10 animals that slot through cut outs in the wagon. The door lifts at the back for easy access. Encourages mobility and helps to develop dexterity and co-ordination. Size: 28cm long x 14cm high. Age 18 months +..
Help your toddler to match the colours and shapes and post them into the box. 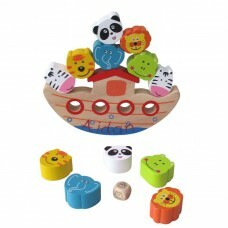 This wooden posting box is a great educational toy, allowing your child to learn whilst having fun! In a pretty pastel blue, it is hardwearing and guaranteed to see your child right through the playschool years. A great early learning toy for developing hand to eye coordination plus shape and colour recognition. Size: ..
Pairs of animals should be stacked carefully so that the ark remains in balance and the passengers do not fall down. 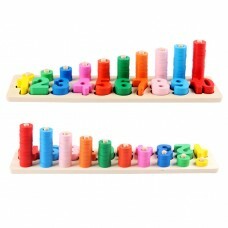 A wonderful dexterity game made of colourfully lacquered wood which trains the fine motor skills and patience. Roll the dice to see which animal must be put on the ark next! Personalisation in hand painted making this an extra special giftSize: 18cm x 16cm x 2cm thickAge 3+.. This great stacking fire engine contains chunky pieces for little hands to take apart and rebuild. Once the pieces are stacked up the free moving wheels mean the fire engine can get on with fighting fire!Size: 13cm long x 10cm high x 8cm wideAge 18 months+.. 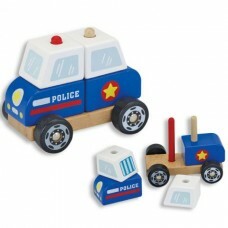 This stacking police car contains chunky pieces for little hands to take apart and rebuild. Great little wheeled toy!Size: 13cm long x 10cm high x 8cm wideAge 18 months+.. 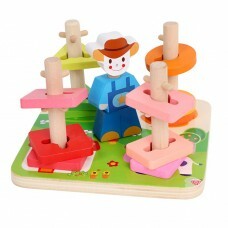 This 16 piece educational wooden farm themed toy provides early learners with an introduction to different shapes and colours. Twist and turn each of the brightly coloured wooden shapes to slide them down one of 4 sturdy pegs until they reach the farm themed base. The farmer in the middle is also a 3 piece stacking toy.An excellent way to improve a child's motor skills including dexterity, concent.. 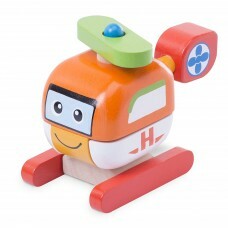 This build and play cute little wooden helicopter can be pulled apart and connected back together again. Develops hand-eye coordination and problem solving.We can hand paint your child's name on the helicopter making it an extra special gift.Size: 12cm long x 9.5cm high x 6.5cm wideAge 18 months+..